These premium super absorbent pads gel when wet to lock in fluid. It has a soft cloth like moisture barrier and rounded edges for greater comfort. A special green layer helps pull fluid away from the body. An adhesive strip will hold the pad securely in place either with incontinence undergarments or your own underwear. 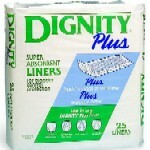 Unlike other incontinence pads, each package includes an opaque storage/disposal bag. For use in any Free and Active garment or your own underwear. Twenty five pads per bag. 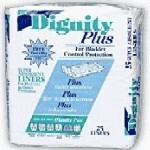 Disposable urinary incontinence liners for moderate to heavy bladder control protection. Highly absorbent with gel to lock in wetness. Reduces odor! 25 liners. 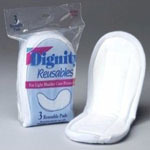 Disposable absorbent pads for urinary incontinence. 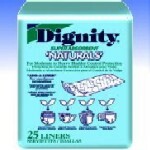 Use with any undergarment with moisture barrier protection. Superabsorbent gel for men and women. Moderate to severe absorbtion rating.